The Ebac 3850e represents a large improvement for Ebac from the once very popular but now dated 2650e model. This refrigerant dehumidifier, new in 2014, is apparently a limited edition model and offers increased extraction performance, a more modern design and a fancy new LED control panel. With it being made solely in Britain at Ebac’s County Durham manufacturing plant we’ve got big hopes for it in this review. However, with stiff competition coming from EcoAir’s DC202, we will not be giving the machine an easy ride. The first thing that hits you when you look at the 3850e is the prominent central colour LED display and the six buttons that surround it. The first button is ‘mode’ and here there are two options to choose from, either ‘smart ‘ or ‘max’. 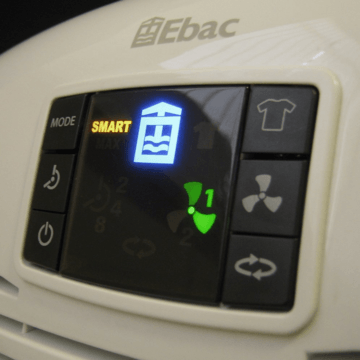 The former of these two modes refers to Ebac’s patented Smart Control technology and is the mode that Ebac suggest you leave the machine on for everyday usage. The literature in the manual and online sources is quite airy-fairy surrounding what this actually does. 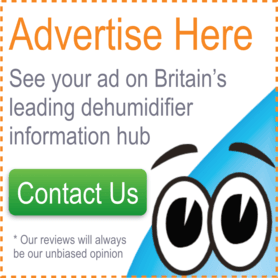 You will notice that it works the same as any other dehumidifier, switching on only when the humidity exceeds the ideal amount and coasting in fan-only mode when the humidity levels are OK. The differences with Smart Control are firstly, you have no option to select a specific humidity (and the guesswork involved here) as the machine will do this for you, presumably dependent on room temperature and humidity. Then Ebac suggest the machine learns our daily patterns (e.g. humidity peaks at 8am after showers) with the benefit presumably that the machine can anticipate humidity events (or lack of) and then help to control these spikes better or to use less energy when it’s not expecting any particular jumps in humidity (e.g. during the day when everyone’s out). 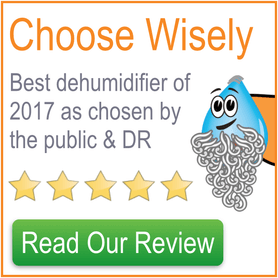 Whether you prefer this ‘set and forget’ type of dehumidifier or one that you have more direct control over the various levels will depend on your personality. The second of the modes, ‘max’, turns the unit on to maximum dehumidifying power and the unit does not stop dehumidifying no matter how low the humidity gets. It also utilises the faster of the two fan speeds to ensure maximum extraction takes place. This function is ideal for drying laundry or a particularly damp room as it will extract moisture as fast as possible by driving the humidity levels lower, pulling more moisture out of wet clothes or walls. We’ll talk about how the laundry setting utilises the ‘max’ mode later in this review. There is also a third mode available, but rather than pressing the ‘mode’ button a third time, Ebac gave it a button all of its own, on the bottom right of the control panel and the icon looks like two arrows in a circle. Press this button and machine will turn into ‘air purifying mode’, which runs the fans so that the air is cleaned by the carbon filter, but it stops any dehumidifying taking place. This mode could be ideal for the summer months. 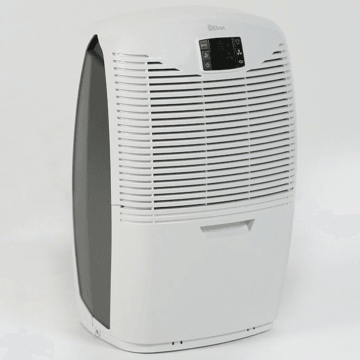 Like most Ebac dehumidifiers, the 3850e comes with a carbon air filter. This nullifies smells such as those from damp, pets, tobacco and husbands and it also has antibacterial properties. Most dehumidifiers that have an antibacterial filter have silver ion antibacterial filters, which don’t remove bad smells but they also don’t need replacing like carbon filters do (or not very often at least). So the carbon filter seen here could be a negative in that it needs replacing every four months or so, costing just under £20 per year, or a positive in that it leaves the air smelling fresher in addition to removing bacteria and other airborne microbes. The timer can be set for either 2, 4 or 8 hours, which is handy if you don’t want to use your dehumidifier at all hours of the day (although this is to be recommended). Intelligently, the laundry setting is a combination of the ‘max’ mode discussed earlier and the timer function. Press the button once, twice or three times and ‘max’ mode will switch on for 2, 4 or 8 hours respectively. After the selected number of hours has been completed the machine will automatically switch back into ‘smart’ mode. This is a simple, but brilliant feature because many other dehumidifiers do not combine the laundry modes with a timer in this way, which means that if you set the laundry mode and the timer independently then once the timer has finished, some models will simply stop doing anything until you remember to turn them back on. Other than the obvious on/off button, the last button to discuss is the fan button, which is used to select one of the two fan speeds. This is useful if used in conjunction with ‘smart’ mode as it gives you the control to turn the fan speed up when you need the extra power boost and turn it back down when you don’t need the power or would like the unit to be quieter. The final thing of note on the control panel of the 3850e is the big Ebac symbol in the middle of it. This will change colour depending on the status of the machine. When it’s blue it means that the unit is dehumidifying, when it’s orange it means that it’s in standby mode (i.e. no mode has been selected) and when it’s red it means that either the water collection bucket is not present or is full. Thankfully the red Ebac symbol indicating that the water collection bucket is full doesn’t need to illuminate too often as it has a large 3.5L capacity, which is about as big as they come on domestic dehumidifiers. We really like the design of the water collection bucket of the 3850e as it’s basically a jerrycan that sits inside the front draw of the unit, so it’s very easy to insert, remove, carry and empty. Having said that, there is a drawback in that you can’t see into the water collection bucket to check the current water level without opening the tray up and peering in, so you’re generally reliant on your own experience and the red control panel light to tell you when it requires emptying. There’s also a continuous drain option, but frustratingly if you need this option, it’s an extra that you need to pay for (currently £12.49, or you could fashion your own). As with other Ebac dehumidifiers, this is really designed to be sat in a position and not moved for the next decade. You’re likely to agree with this approach after you’ve unpacked the 13kg machine and moved it into place. It’s a shame that there’s no proper handle to assist with moving it, but if you were looking for a highly portable machine then you wouldn’t be looking at the 3850e. The machine is much easier to roll around on the castor wheels that can be fitted, but you’ve guessed it, they’re also an optional extra. The machine measures 50.2cm high by 32.5cm wide by 27.5cm deep. Those dimensions and the 13kg weight are pretty good for a refrigerant dehumidifier of this power. The appearance of the 3850e is a large improvement over the older models. The elliptical shape is unique to Ebac and although it’s still got a big ugly grille on the front, the LED display and grey side panels really set the professional look off. Other than the portability issues with the design already highlighted, access to the air filter is relatively easy, the water collection bucket is a triumph and the same could be said for the control panel. This is a powerful refrigerant dehumidifier so it was never likely to threaten the quietest models available, however, the (new?) compressor in the 3850e is refined and very quiet while dehumidifying, probably quieter than its less powerful predecessors. In fan-only mode the dehumidifier is slightly louder than its preceding models at 46dB versus 44dB, but this is due to it being more powerful and isn’t a noticeable difference. Having two fan speeds that are selectable through the main menu is great for noise control, as if the noise is ever bothering you, it’s easy to turn the fan down a notch and drop a lot of the noise that comes with the greater of the two fan speeds. 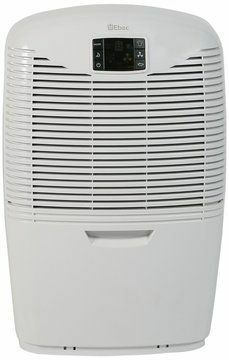 The best place to site any dehumidifier is an upstairs landing and that would be a great place for the 3850e as while the sound it produces may disturb those who are sensitive to noise if it’s placed in the bedroom, it shouldn’t be audible if placed on the landing. Similarly it would be fine in the room that you watch television, but during quieter moments during films you may prefer that it wasn’t in the room with you. This is a well-engineered, powerful unit from a company respected for their quality record and should be more than capable of controlling the humidity of the average five bedroom house. It’s rated to extract 21 litres per day at 32°C and 90% relative humidity. At UK temperatures the machine will extract a lot less, but enough to control the humidity of a large family home as described in the paragraph above. As with all refrigerant dehumidifiers, the machine will extract less and less water as the temperature drops, so try to keep your home above 15°C to get the best out of it. Having said that, Ebac say that the unit will keep working down to 3°C and as you’d expect, there’s an automatic defrost setting that will switch on with increasing frequency as the temperature drops to maintain the efficiency of the unit. We really like the Ebac 3850e, and as it’s being touted as a limited edition model it would be wise to get your hands on one sooner rather than later. This store has a great sale on and free delivery at the moment, so it could be worth checking that out if you’re interested.